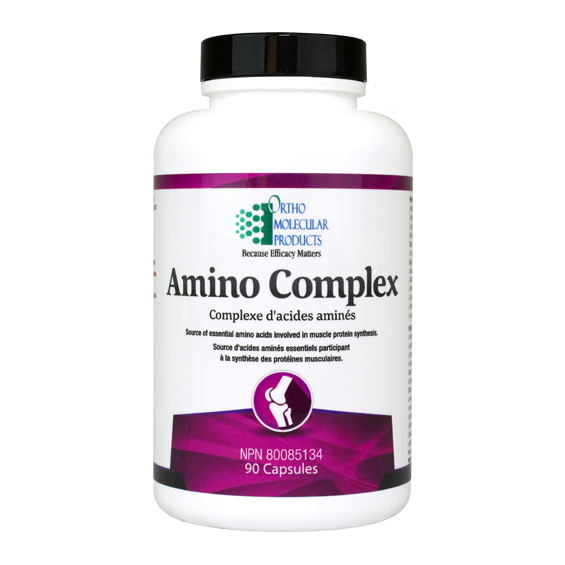 Amino Complex is a comprehensive formula containing all nine essential amino acids and key conditionally essential amino acids, which become essential in certain circumstances. Adults: Take 3 capsules per day. Store in a cool dry place. Amino acids are building blocks for all body proteins and contribute to muscle protein synthesis. Individually, amino acids function as precursors for heme, purines, pyrimidines, hormones and neurotransmitters, including production of biologically active peptides and short-chain fatty acids (SCFAs) in the gut. In addition, amino acids provide the body with nitrogen, which is essential for general growth and maintenance. The human body can produce 11 of the 20 amino acids needed (non-essential), but the remaining nine must be obtained from the diet, making them essential. The essential amino acids (EAAs) are histidine, isoleucine, leucine, lysine, methionine, phenylalanine, threonine, tryptophan, and valine. Tyrosine is considered nonessential because it requires only one step for conversion from phenylalanine. Failure to obtain enough of even one of the EAAs results in degradation of the body’s proteins.